I am deeply indebted to Rev. David Stretton and Rev. Ian Coverdale for their assistance in providing the answers. David currently serves as the minister for Arnside Methodist Church and Ian is a retired Methodist minister. What I write below reflects my own beliefs and views rather than any official Methodist Church position, although hopefully the two will coincide on at least some occasions. As you read my responses, you will notice that my views have changed over time. One of the many things that I cherish about the Methodist Church is that it respects the integrity of our individual journeys of faith – as we attempt to travel with God we are changed. How would you define the term 'Born-again Christian' ? I’ve never met anyone who has described themselves as a Born Again Christian, so I’ve never had the chance to ask them. If you’d asked me this question ten or twenty years ago then I would have responded that it is someone who has ‘got God’, gone slightly over the top about God, and smiles a little too much. I hope that today I am more mature and measured in my response. Many people are ‘Cradle Christians’ in that they have been raised as Christians from birth, accepted their faith, turn up to church on a Sunday, and it is just a part of their life that they don’t really think very much about. Some of these Cradle Christians then have an experience of God (which can take many, many different forms) that wakes them up to God’s presence in their lives- suddenly they get what God is all about – and it changes their outlook on everything. For me, these are Born Again Christians. What do you feel are the biggest challenges facing the Christian Church today ? Our biggest challenge is very easy to identify – it’s just hard to do something about: We don’t trust in God enough – especially when that trust takes us to uncomfortable places. 1. Pray more – much more. 2. Be open to change, even when it is not to our liking. 3. Be prepared to recognise God at work even when numbers are not increasing. 4. Be less obsessed with getting young people into the church, because this obsession blinds us to the fact (and the opportunity which goes with it) that most older people never come to church. As an ordained minister, what do you feel are your primary and secondary roles ? Will you hold before us the story of God’s love and mercy, above all, the Gospel of Jesus Christ, and will you be among us as one who preaches the word of God, administers Baptism, presides at the Lord’s Supper, teaches the faith, and cares for the flock? Will you hold before us God’s call to holy living and be among us as one who awakens the careless and strengthens the faithful? Will you hold before us God’s commitment to human community, to our neighbourhoods and all who live within them, and to the world that God has made? These are the things that I try to prioritise in my work, it’s a great job description – and very hard to achieve!! What are the Wesleys’ legacies to (a) Methodism, (b) The rest of Christendom ? 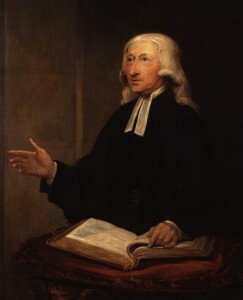 We are all blessed to have the sermons of John Wesley and the hymns of Charles Wesley to enrich our journey of faith. In addition, I particularly admire the Wesley brothers’ example of energy and missionary zeal, their sense of urgency for the task at hand. Something that I believe we could learn from them is their being prepared to be on the edge of the church establishment if that is what is necessary to win people for Christ. This position of being on the margins of the church alongside people on the margins of society is an example and a challenge to us all. How significant is the Methodist adoption of the ‘Declaration on Justification’ ? Here is a central part of our faith that, as three independent Christian denominations, we can agree on. This is a good thing: I’m always surprised that Christians of different denominations have so little knowledge of what other Christians believe – and particularly how similar our beliefs are. The more that our beliefs coincide, the more relaxed we can be with one another – and then we can pray and work together to build God’s Kingdom. What is your view of ecumenism between Protestant denominations ? My views on ecumenism have changed significantly over my years in ministry. At the beginning I was not interested at all. I thought that we could all do fine on our own in our own separate churches. I was not in favour of one large, single Christian denomination. Today my views are different. I continue to value the existence of a number of Christian denominations – I believe that people find God in all kinds of different ways and so it is important that there are a wide variety of church traditions to meets people’s differing needs and experiences of God. But, I am very aware that one set of Christians do not live in isolation from all other Christians. If you live in a village or town and go to a church, you will undoubtedly know other Christians who go to different churches. When all those who know one another, but who are from different Christian traditions, can come together on occasion and share and celebrate their love of God and God’s love for them, then this is a very special thing. My experience of the practical aspect of ecumenism – organising joint services and events – has been that if we have spent time praying together and getting to know one another, then this has been successful. But, when we have jumped straight to the event then it has not worked out. In the last 100 years, What are the most important events in Christianity ? I think that the most significant events in Christian History over the last 100 years have been the two most significant events in World History – the two World Wars and all the attendant suffering. Man’s inhumanity to man has been exposed for all to see. Those returning from war, and those who have experienced it in different ways, have been faced with fundamental questions about God, about themselves, and about our place in the world. For many people this has resulted in a crisis of faith which they have not been able to work through. Something else, possibly of equal significance, but not an event in itself, is the growth of consumerism. This insidious Western disease undermines our whole value system. More and more people are defining themselves only in terms of what they own. Consumerism is becoming some kind of quasi religion. Many people feel Christianity is irrelevant. What can be done to change this ? We should love one another and the community around us. Unconditional love is what will win people over. How optimistic are you for the future of Christianity in the UK ? Very. I have no doubt whatsoever that Christianity will continue in the UK. Undoubtedly it will take a different form from now, but the core beliefs will remain and will still be relevant to people’s lives. The majority of people in the UK have some sense of spirituality, some sense of something bigger than all of us – our challenge is to enable them see that Christianity helps them to frame this in a coherent way that is useful to their lives in the world. We will only achieve this through prayer – through listening to God. All around us, there are academics and clever people who say that God doesn’t exist and religion is just a ‘con-job’ – that there’s no evidence. I can remain hopeful in the face of what often feels like an onslaught because I can point to people who have experienced God, and I can point to people whose lives have changed because of that experience. The following answers were kindly provided by Rev. Ian Coverdale. What, in your view, is the single most important aspect of the Christian religion that sets it apart from all others? For me that can be answered in one word – Christ. In Jesus Christ I see God in human form. I see the extent to which God loves each of us – that he is willing to die for us. How best can we describe the relationship between faith and reason (fides et ratio)? I don’t see these as opposed to one another. While faith may take me beyond what I can know by reason alone, it is not counter to reason. Reason helps me sift my faith and test its truth. How can the Christian faith remain relevant in an ever-changing world? Christian faith and its expression have always been changing, right from the early days recorded in the book of Acts. It is only by changing that it remains relevant and challenging to the cultures within which it operates and effectively proclaims the unchanging message that ‘Jesus is Lord’. Was the Reformation (and subsequent division of the church) justified? While there were numerous things in the pre-reformation church which needed to be corrected I am saddened whenever the Body of Christ is divided. Christ prayed that we should be one. What does the term 'Sola Scriptura' mean to you? I have a high view of scripture and its place in the Christian faith. Nevertheless I think that it is not the sole authority that we have. We interpret it in the light of reason, individual experience and the cumulative experience of the church. How best can Christians of different denominations/traditions seek to work together to overcome their differences? Remember that we are first Christians and only as a very distant second members of our various denominations. It would also help if we learnt to focus on what unites us rather than what divides us. What were/are some of the high points and low points of the Continental/English reformations for you? I am impressed by the sheer bravery of some of the reformers in standing for what they believed to be right. But when I look at the history of Europe since the reformation I am appalled by the slaughter that has been condoned in the name of Christian faith. Is the Bible infallible, inerrant or something else? For me the bible writers were inspired by the Holy Spirit when they wrote what they did. These writings speak in ways that others do not. However their authors were human. Generally they do not seem to be aware that what they were writing would come to be regarded as holy writ. What, in your own words, would be an good definition of hell? An absence of the God of love! Can we have a 'reasonable hope' of universal salvation for all? I find nothing in scripture that speaks of universal salvation. God seems to respect the decisions that we make – even if that decision is to turn our back on him. What do the terms 'election' and 'reprobation' mean to you? These terms seem to limit God’s potential to rescue to some specific people. On the contrary I would want to affirm strongly that whoever would can come to God and find acceptance. Note: Also available are answers to questions on Methodism and other aspects of the Christian faith, from Rev. Andy Halstead, who currently serves as a Methodist Minister. The first thing expressed in my seal is a cross, black, within the heart, to put me in mind that faith in Christ crucified saves us. "For with the heart man believeth unto righteousness." Now, although the cross is black, mortified, and intended to cause pain, yet it does not change the colour of the heart, does not destroy nature - i.e., does not kill, but keeps alive. "For the just shall live by faith," - by faith in the Saviour. But this heart is fixed upon the centre of a white rose, to show that faith causes joy, consolation and peace. The rose is white, not red, because white is the ideal colour of all angels and blessed spirits. This rose, moreover, is fixed in a sky-coloured ground, to denote that such joy of faith in the spirit is but an earnest and beginning of heavenly joy to come, as anticipated and held by hope, though not yet revealed. "[The Lord's Supper]..is an ordinance for redeemed sinners, and not for unfallen angels. By receiving it we publicly declare our sense of guilt, and need of a Saviour - our trust in Jesus, and our love to Him - our desire to live upon Him, and our hope to live with Him. Using it in this spirit, we shall find our repentance deepened, our faith increased, our hope brightened, our love enlarged, our besetting sins weakened and our graces strengthened. It will draw us nearer to Christ."